Not that I need a reason to make chocolates, but I’d just got my hands onto a sugar-free chocolate compound and I had to try it out especially since I’ve been on the look out for this compound for a quite a few years now. It’s super economical and very easily available. Yippie! It was a Sunday morning and I was up bright and early, even before the clock struck 7am! I wasn’t too sure of my breakfast plans and was waiting for my husband to come back home–he goes long distance cycling every weekend–before I brewed a pot of tea. My mind kept going back to the chocolate that sat on the second shelf of my baking cabinet. The tea would have to wait. Out came the almonds, pistachio, dates and walnuts. My task was set. 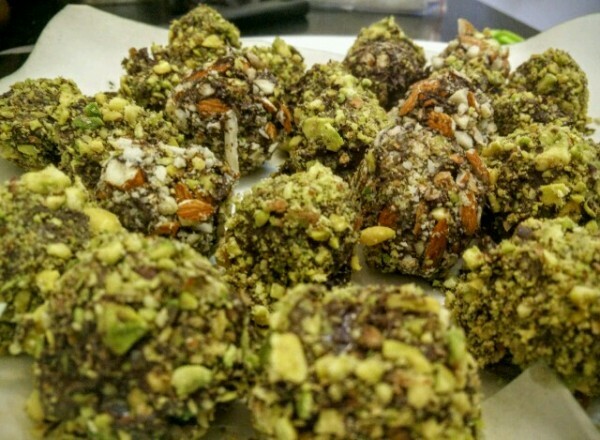 I’d decided to make soft-centered dry-fruit stuffed chocolate truffles. The sticky mess, that can be moulded too if you wish. In fact use it to make sugar free modaks, if you celebrate the arrival of Ganpati! 1. 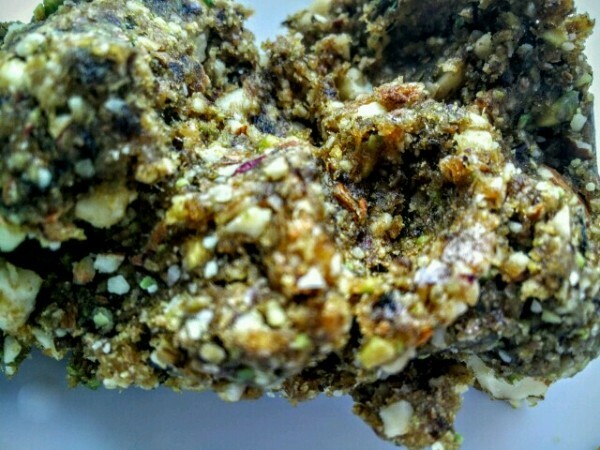 Grind the whole almonds, walnuts, pistachio and dates together. It creates a sticky mass. 2. Make small balls out of the dry fruit fix and place it in the refrigerator to cool. 4. Once the chocolate is tempered start dipping the dry fruit balls in the chocolate and placing them on a tray lined with butter paper. When all are done, place the chocolates in the fridge for 20 minutes. The heavenly path to roll on! 5. 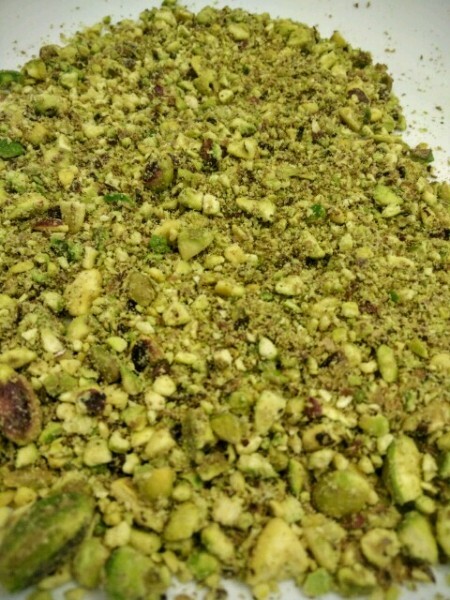 Place the almond and pistachio flakes in a bowl or a plate. 6. Re-dip the chocolates in the tempered chocolate and quickly toss them in the bowl with almonds and pistachio flakes. Ensure they are completely covered in the flakes. Place them on a butter paper and cool again for 20 minutes. 7. 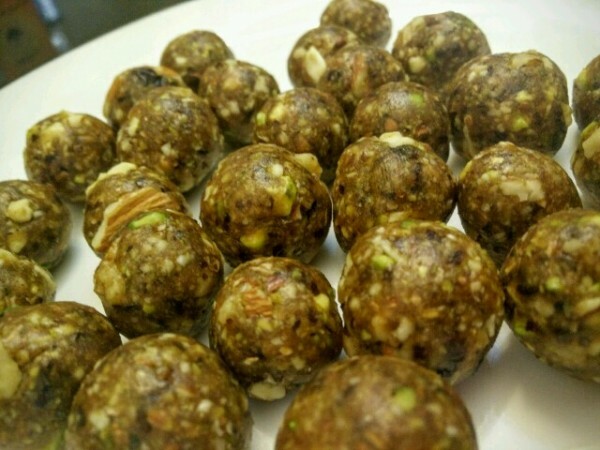 Your sugar-free dry fruit chocolate truffles are ready! Fill a pot with water and bring it up to a simmer. Place a second bowl on top of it. Make sure the bowl is bigger and the boiling water under it doesn’t run into this bowl. Put about 2/3 of your chocolate in the bowl and let it melt till it is almost 2/3 melted. Gently stir the chocolate to break any clumps. Remove from heat and add the rest of the chocolate. Stir till it is completely melted. The chocolate will begin to thicken and become less shiny and more matte as it cools. Once its ready you can start using the chocolate as you wish.